The village Anina (German: Steierdorf) is located in Romanian Banat’s Caraş-Severin district and lies in a beautiful landscape of mountains and rolling hills. After Matthias Hammer had discovered a “shiny black stone” in Porcar Valley in the late 18th century, Anina soon developed from a charburner hamlet into a mining town. It became the second most important mining area of Romania. The city is divided into two districts: old Steierdorf and Anina, the newer part. Anina used to be highly industrialised. 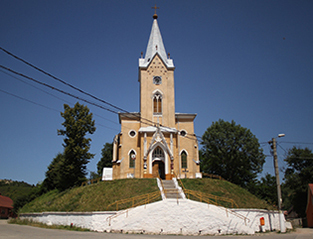 The Roman-Catholic church of Anina is located on a hill and built in a style inspired by neo-gothic. Its square is very busy during parish fair times. Folklore dance is performed and accompanied by a miners’ brass band. The church is only 50 metres from the spot, where – as local legend has it – the first settlers cut a primeval forest tree. Its stump was used as an altar for the first service and a little wooden chapel was built on the same ground. 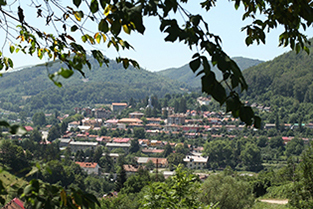 The cemeteries of the Banat Mountains are not only worth visiting for locals. The well cared for cemetery of Anina tells stories about the history of its inhabitants. The names on the gravestones and crosses reflect changes in the composition of local society and even display the economic and social duties of representatives of different ethnicities. It is also interesting to observe how the design of crosses changed: once made from cast iron, later wrought-iron or made from stone; most of the modern crosses are quite simple. The national communist Romania decided to build the first and largest oil shale power plant of Romania in Anina. The large deposit of oil shale already became known in the 19th century. Using distillation techniques, shale oil was produced. Older inhabitants still call petroleum “shale oil” today. In the 1980s, Anina became part of a gigantic project: the oil shale was supposed to be mined, ground and immediately burned on site – a yearly amount of 13 million tons of oil shale, with no consideration of economic reason or ecological caution. In order to set the plan into action, Anina was planned to be torn down, the population either resettled in tower blocks or recruited to migrate to Germany. At that time, the city was governed by a “special regime”. While food was rationed in the rest of Romania and could only be acquired with coupons, Anina’s residents received many things on the side. The salaries were quite high as well; a truck driver in the mine received in a month what a teacher was paid in one year. Soon after the fall of the Iron Curtain, the megalomaniac project was abandoned, though. 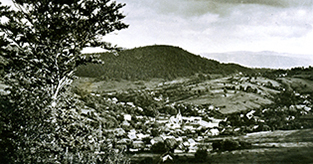 Anina located in a hilly landscape, early 20th century. 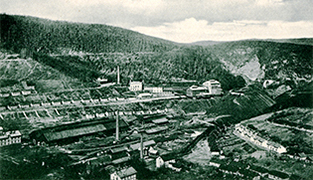 In the 19th and 20th century, Anina was an important mining centre. View of Anina’s city centre. The Roman-Catholic church of Anina is inspired by the neo-gothic.